The demise of socialism in Eastern Europe and the subsequent dissolution of the Soviet Union brought an end to decades of preferential trading arrangements upon which the Cuban economy had come to rely. The initial response to this crisis by the Cuban government was, among other things, to issue a call for the Cuban economy to become better integrated into the global economy. More recently, however, Fidel Castro and other high level Cuban government officials have increasingly called upon developing nations throughout the world to reject the process of “neoliberal globalization.” At the very least, this change in official position suggests that the Cuban government found the process of “inserting” its economy into the global economy to be more difficult than initially expected. At a more fundamental level, it may be an indication that the Cuban government recognizes the incompatibility of its centrally planned, socialist economic system and the market forces driving today’s international marketplace. Cuba’s agricultural sector, which historically has been a critically important element of the Cuban economy, was particularly hard hit by the loss of trade preferences and subsidies. Because of the key role that agricultural exports have played in the Cuban economy, as well as the country’s heavy reliance on agricultural imports, one of the key issues for the Cuban government over the past 10 years has been, and continues to be, the role that the agricultural sector will play in the future, both in terms of generating hard currency export earnings and feeding the population. Since 1990, officials at all levels of Cuba’s agricultural ministries have struggled to respond to the crisis brought on by having been thrust into the “world market” to an extraordinary degree with such great speed and from such heavily subsidized levels. Cuba’s agricultural sector has continued to evolve in response to selected policy changes implemented in the period until 1994 (the break up State farms into Unidades Básicas de Producción Cooperativa, UBPCs, and the opening of agricultural markets for the sale of “surplus” production beyond quota obligations), and other internal developments.1 Nevertheless, questions remain regarding the sector’s long-term competitiveness capabilities. Cuba’s agricultural trade patterns have changed dramatically since the late 1980s. Agricultural and food imports have fallen significantly, primarily due to foreign exchange shortages. However, because of the critical need for food imports to feed the Cuban people, agricultural and food imports have not fallen as much on a percentage basis as other import categories, and they now represent a higher proportion of Cuba’s total imports than at any time in the last 50 years. Despite some of the aforementioned policy changes, in Cuba production decisions for crops destined for domestic consumption are still based largely on artificial prices determined by the State for sale to the government collection agency, Acopio. The agricultural markets discussed previously have changed this to some degree, however the prices in these markets are still not totally reflective of a free market. (The Cuban government periodically introduces its own products into the agricultural markets if prices in the markets are perceived to be rising too high since the Cuban government acknowledges that citizens in the City of Havana, for example, must rely on the agricultural markets for approximately one-third of their nutritional requirements.4) As a result of these distortions in the domestic food market, Cuban agricultural and fisheries exports tell a much more important story regarding the competitiveness and viability of these sectors since the export levels respond to price signals in the global marketplace. 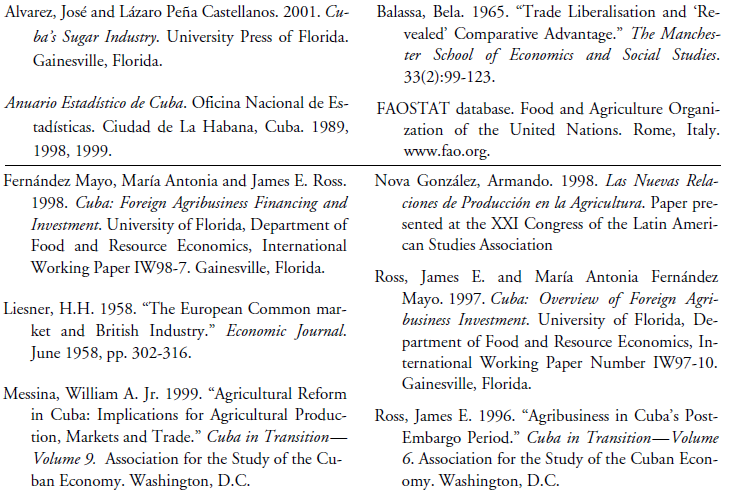 In an effort to quantitatively assess the evolution of Cuba’s agricultural and fisheries export sectors during the Special Period following the loss of Soviet support and subsidization, this paper employs analytical techniques and measures to evaluate the relative export performance of Cuba’s 10 most important (in value terms) agricultural and fisheries exports for the years 1985 through 1999. The results are then converted into an index for ease of comparison across commodities. For purposes of this study, data is analyzed for the years 1985 through 1999. This allows examination of five years’ worth of data (1985 to 1989) during which Cuba was receiving its full complement of trading preferences and subsidies from the former Soviet Union, and 10 years worth of data during which Cuba’s agricultural sector was functioning essentially without subsidization. The top portion of Appendix Table A.1 contains export values for Cuba’s top 10 agricultural and natural resource-based export commodities and products (including fish and shellfish), as well as Cuba’s total export figures. Cuban data are taken from various issues of the Anuario Estadístico de Cuba. Table 1 contains export values and rankings for each of these 10 products (drawn from Appendix Table A.1) for the years 1985 and 1999 to document shifts in rankings that have taken place. The lower portion of Appendix Table A.1 contains the world totals for the same data series as the top portion of the table. World figures are from the Food and Agricultural Organization of the United Nations FAOSTAT database. Appendix Table A.2 contains revealed export advantage calculations using the data in Table A.1. Table 2 shows the indices derived from the RXA calculations in Appendix Table A.2, with 1985 as the base year (i.e., 1985=100). Looking first at sugar because of its dominant role in the Cuban economy, the general rise in RXA from 1985 through 1990 is an indication of the influence of the trade preferences Cuba was receiving from Eastern Europe and the Soviet Union. 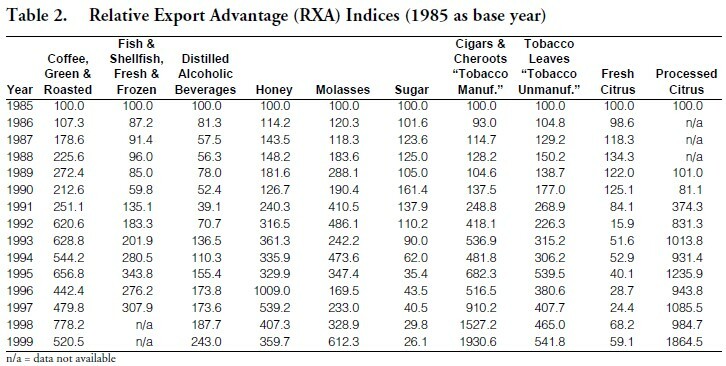 In 1990 in particular, the RXA showed a substantial increase which reflects the jump in the value of Cuban sugar exports in the last full year of Soviet subsidization, and in a year when total Cuban exports did not increase appreciably (see figures in top portion of Appendix Table A.1). After 1990, the index declines steadily and dramatically, reflecting the general deterioration experienced by the industry following the loss of trade preferences with Eastern Europe and the former Soviet Union. In the case of molasses, a pattern similar to sugar might be expected. However, as can be seen in Appendix Table A.1, the value of molasses exports has not decreased nearly as much on a proportional basis as the value of sugar exports. Thus, in this case, the RXA index is more reflective of the increased importance of molasses in Cuba’s agricultural export mix resulting from the significant decrease in the total value of Cuban exports after 1990. 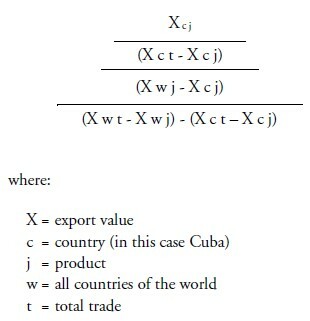 Appendix Table A.3 contains data to illustrate this; it shows the value of Cuba’s exports of the commodities analyzed in this study as a percentage of Cuba’s total exports. Data in this table indicate that, despite their decrease in absolute terms, the value of exports of molasses represents more than twice as large a percentage of Cuba’s total agricultural exports in 1999 as it did in 1985. However, the value of molasses exports is so small that it is not particularly significant for Cuban export performance in general. The situation is similar for honey, unmanufactured tobacco (tobacco leaf) and coffee. It should be noted, however, that the examination of coffee faces some data inconsistencies. The data series for Cuba from the Anuario issues is for “Coffee, Tea and Cocoa” while the world data series from FAOSTAT is for “Coffee, Green and Roasted.” However, an examination of years for which disaggregated data are available for Cuba indicates that coffee consistently represented upwards of 97 percent of the value of the aggregated value of Cuba’s “Coffee, Tea and Cocoa” exports, which makes a calculation of the coffee RXA worth considering. The RXA index for the fish and shellfish category actually shows decreases in relative export performance in the late 1980s and increases from 1991 onward. However, potential data problems exist for this commodity as fisheries specialists have indicated that the FAO “fish and shellfish, fresh and frozen” data series may not include the same products as the Cuban data series; in such a case the RXA index would not be particularly meaningful. Furthermore, use of the aggregated data for fish and shellfish does not permit examination of an otherwise interesting story; within Cuba during the 1990s, there was an important effort to expand production and exports of high value fisheries products such as lobster and shrimp. To the extent that this effort was successful, this could explain the increase in the RXA index during the 1990s. In the case of Cuban exports, the distilled alcoholic beverage category is essentially rum. For this product category, the RXA index decreased from 1985 through 1992, with improvement thereafter. Inasmuch as there has been some foreign investment in the rum sector, one might expect this result to be reflecting the influence of such activity. However, the value of distilled alcoholic beverage exports was considerably lower in 1999 than it was in the base year of 1985 (see Appendix Table A.1). As was the case with several commodities previously discussed, the increasing RXA index is a reflection of the fact that exports of distilled alcoholic beverages represent a larger proportion of the substantially smaller value of Cuba’s total exports. Cigars show the largest increase in relative export advantage index. This is because of the nearly tripling of the value of Cuba’s cigar exports and, in particular, the increase seen from 1997 through 1999. Multiple and active foreign joint venture investments would appear to be at least partially responsible for the improvement of this RXA index series. Perhaps the most interesting case is that of the citrus industry in Cuba. In the early 1990s, decreases in the fresh citrus RXA index are directly attributable to the loss of preferences in Eastern Europe and the former Soviet Union. At the same time, there were a number of foreign joint ventures in the citrus industry in Cuba during the 1990s. The continued decreases in the fresh citrus RXA index during the mid to late 1990s reflect the fact that foreign joint venture partners were not focusing their efforts on promoting fresh citrus exports. Rather, their energies appear to have been spent in advancing the exports of citrus juices as can be seen in the increase in the processed juice RXA export index series. During the 1990s, Cuba has been actively seeking trade agreements with many country members of CARICOM.7 Its participation as a full member of The Association of Caribbean States (ACS)8 ties Cuba to the broader Caribbean, at least on paper. These developments suggest that, to some extent, Cuba’s efforts in the Caribbean region represent the most tangible attempts to “engage” in globalization and the ongoing trade liberalization negotiations. However, Cuba’s trade flows within the Caribbean have not increased to any appreciable degree primarily because, in agriculture in particular, it tends to export and import the same crops and commodities as its Caribbean neighbors. In a world of subsidies and preferential trade arrangements, Balassa makes the case that RCA and RXA measures do not provide much insight into comparative advantage, competitiveness and export performance. While Cuba was forced into the “free market” beginning around 1990, the Caribbean still enjoys most of its trade preferences for agricultural exports. For that reason, RXA measures for a number of the Caribbean countries that have been calculated previously by Taylor and Bonnett9 have not proven to be comparable. In subsequent work, the authors will examine alternative methodologies in an effort to offer some comparison between Cuba’s relative export performance and that of selected countries in the Caribbean. In summary, the RXA appears to be a useful tool for analyzing the performance of Cuba’s agricultural export sector. It helps to quantify the decline that Cuba has experienced in the export performance of its sugar industry and it offers interesting insights into the improved performance of selected other commodity sectors. • Labor—Bringing the Working Youth Army (EJT) into agricultural production has been one of the most important examples of resource reallocation by the Cuban government during the Special Period. However, there is little indication that these human resources were allocated to where they would be the most productive. Also, it is difficult to envision that the limited agricultural skills of the EJT enabled the agricultural sector to significantly improve its efficiency. Still, it does represent an increase in the agricultural labor force. • Capital—Since 1990, the Cuban government has had precious little capital to invest in agricultural, even for fertilizers and chemical inputs, let alone for machinery and equipment. Therefore, in reality, the resource reallocation process that is taking place within Cuba’s agricultural sector is being driven almost exclusively by foreign investment and foreign business partners. Because of the relative lack of domestic purchasing power, to this point foreign investment in Cuban agriculture has generally been limited to crops and commodities with the potential for export at profitable price levels (and, in a few cases, for products with potential for sale to the tourist industry in Cuba). Furthermore, without the prospect of access to the U.S. market, significant new investment necessary to alter the competitiveness of Cuba’s agricultural sector is unlikely. 1. For additional detail on this topic, see Messina, 1999. 2. The history of and prospects for Cuba’s sugar sector are comprehensively examined in Cuba’s Sugar Industry by Alvarez and Peña Castellanos (2001). 3. For additional information on foreign agribusiness investment in Cuba see: Fernández Mayo and Ross, 1998; Ross and Fernández Mayo, 1997; and Ross, 1996. 5. Use of relative export performance as an indicator of comparative advantage goes back to the work of Liesner in 1958. Balassa’s (1965) methodology extends the work of Liesner. 6. Specifically Balassa points out that such an approach avoids the difficulties which arise from trying to incorporate variations in efficiencies for an industry between countries into efforts to measure comparative advantage, as well as the problems that are encou ntered in applying Hecksler-Ohlin theory to the three factor case (labor, capital and material inputs, or intermediate products) and more than two countries (pp. 101 to 103). 7. The Caribbean Community, which includes Antigua and Barbuda, the Bahamas, Barbados, Belize, Dominica, Grenada, Guyana, Haiti, Jamaica, Montserrat, St. Kitts and Nevis, Saint Lucia, St. Vincent and the Grenadines, Suriname, Trinidad and Tobago. 8. Full members of the ACS include: Antigua and Barbuda , the Bahamas, Barbados, Belize, Colombia, Costa Rica, Cuba Dominica, Dominican Republic, El Salvador, Grenada, Guatemala, Guyana, Haiti, Honduras, Jamaica, Mexico, Nicaragua, Panama, St. Kitts and Nevis, Saint Lucia, St. Vincent and the Grenadines, Suriname, Trinidad and Tobago, and Venezuela. 9. Separate research report not yet released. About William A. Messina, Jr.
William A. Messina, Jr. is an agricultural economist with the University of Florida/IFAS, Department of Food and Resource Economics.